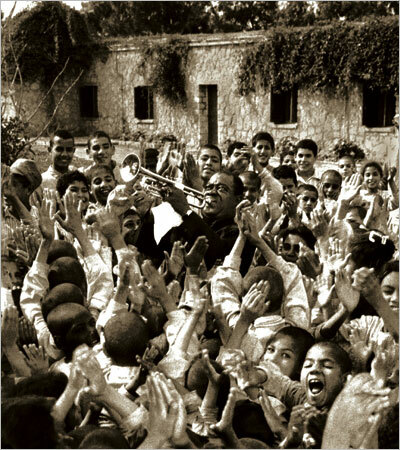 When Ambassadors Had Rhythm - Christopher C. (Kiff) Gallagher, Jr.
“Armstrong, Goodman, Gillespie and the rest were linking freedom in music with freedom in life.” Above, Louis Armstrong in Cairo in 1961. We can argue all we want about the “intrinsic verses the instrumental value” of the arts. We can take our MBA’s and social entrepreneurs and calculate the SROI (return on social investment) and “cost per MusicianCorps Fellow” (AmeriCorps Member). But the more complex our domestic and global challenges become, the more we’re going to need to develop new narratives, new stories that help create a positive future. Could music play a role? The picture above tells a thousand words.